These days, shopping isn’t just shopping, it’s comparison shopping. For most of us, it’s second nature: we don’t just book a flight to Florida, we go to Kayak (or Expedia or TripAdvisor) to compare the cost of different times, routes and airlines. Parents don’t just send their child off to the university with the biggest scholarship check, they use this worksheet from the U.S Department of Education to make sure they’re getting the most value for their money. And now, thanks to CarGurus.com, buying a used car has taken on a similar dimension. what types of used cars are available in your area, whether they’re a good deal, how many miles their previous owner logged, and virtually any other spec you can think of. Though the site has been around for about seven years now, it has recently taken off. “We’ve gone from obscurity,” he said, noting recent triple digit traffic growth. This success is in part because the timing is right — Edmunds.com recently projected that there will be up to 500,000 cars coming off lease this year — and in part because consumers seemed ready for a site that helped them compare apples to lemons. Frequent readers of this blog might remember that Jean herself used CarGurus last summer to help find an adorable Beetle convertible. As she noted then, the site has many used car listings that you might find elsewhere. The difference lies in the color-coded arrows that tell you: great deal, good deal, fair deal, or high price. You can also filter results not just according to location, mileage, and transmission (the basics), but all the way down to color, trim color, miles per gallon and special features like leather seats and sunroofs. CarGurus also tells you how long a car has been listed; the longer it’s been on the site, the more negotiating power you have, which will be indicated with a green “high leverage” icon. “We use math to try to help consumers figure it out,” Steinert explained, noting that the algorithm is complex and not unlike what Google uses to pull search results. “There’s a ton of math – and the very first listing is always the best deal.” That’s his promise to consumers: while CarGurus makes its money when shoppers contact dealers, dealers do not pay to feature certain cars at the top of the search results. On other sites, Steinert said, the first several listings are often the ones that have paid to be there. 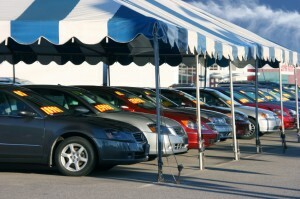 Used car prices are like gas prices; in other words, cheaper in the winter. If you don’t need a car right this second, you can save up to 5 percent by waiting until November or December. Generally, you’ll do better if you shop in the city, not the suburbs. In smaller cities or even suburban areas, there is less competition on average. That, leads to higher prices. Finally, cast a wide net. Expanding your search radius to cover more area can save you 11 percent.